We couldn’t be happier, thank you all for the overwhelming support, commitment, and enthusiastic encouragement. 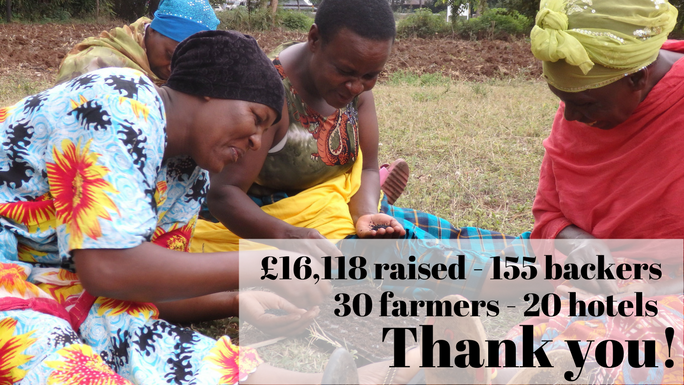 In the last 24 hours, we came so close to our target, raising an amazing £16,118. This means that we will be able to run this transformative project in Malisita, Tanzania for the full six months that our farmers need to train, receive mentoring, and grow their first, significantly improved harvest. We have 20 hotels on board already, they would love to be able to buy produce for their guests locally, at a quality and consistency they need. We have been working with the hotels to help them understand what benefit working with our cooperative of farmers will add to their business. Over the next six months we will build these partnerships, making sure that the farmers can grow what is needed for the hotels. With so many hotels and tourist lodges in the local region, we are confident that once our farmers have proved that they can grow high-quality produce, then more hotels will want to partner with us. This really wouldn’t have been possible without you. The importance of our project has been shared far and wide, reaching many different groups of interested people and already sparking many fascinating conversations. If you would like to keep in touch and see how the project is progressing then please do sign up to our mailing list – we will let you know how our farmers are getting on, what they are focusing on, and the results of their first new harvest. If you would like to discuss this in more depth, then I would be very happy to talk to you, the best way to contact me is on tricia@equalityintourism.org. Preparing the training farm and nursery, hiring a nursery nurse to look after the children whilst the women are learning and working, and buying seed trays, seeds, drip irrigation equipment, and everything needed to become more successful farmers. The cooperative will be formally launched and the women will continue with their business and financial training. They are learning how to save what money they can – for most this is only 50p a week, but this will offer them more security and they will be able to access microfinance loans to invest in the business, paying it back over time. Our local partners will be there to train, mentor, and support our farmers, they will also be a strong focus on increasing the personal confidence of these women and feelings of empowerment within their community. We will continue to speak with other organisations excited by the unique nature of our project, working with our partners – locally and internationally – to make sure that we learn as much as we can from this first stage. This method of on-the-ground training, empowerment, and increased community support has real potential to kickstart a revolution in the way that tourism integrates itself within local farming communities, not just in Malisita, but across Tanzania and further afield.